With an astounding number of varieties available---around 25,000 different types known and more being discovered all the time---the orchid flower is admired around the world for its vast selection, and delicate and exotic aesthetic. Orchids are a favorite bloom for paintings, largely in part to their simplistic yet profound presence. You can learn to paint orchids and create a painting of your own with just a few basic art supplies. Pour some yellow acrylic paint into a small plastic container. Dip a small paintbrush into the yellow paint, just enough to coat the bristles on the brush. Remove the brush from the container, place the tip of the brush on a piece of art paper or canvas where you want the center of the first orchid located and paint a solid circle of yellow. Pour some white acrylic paint into a small plastic container. Dip a small paintbrush into the white paint, just enough to coat the bristles on the brush. Remove the brush from the container, place the tip of the brush somewhere on the outer edge of the yellow circle and paint a large, rounded leaf out from each side of the flower. Paint a third petal over top of the center circle, in between the side petals, slightly overlapping behind both petals. Paint a small rounded leaf out from each side of the flower, underneath a side petal. You should now have what looks like five separate petals spread around, to finish the flower. Repeat for as many orchid flowers as desired. You can leave the painting with just the orchid flowers, or add in sticks of brown leading from each flower. 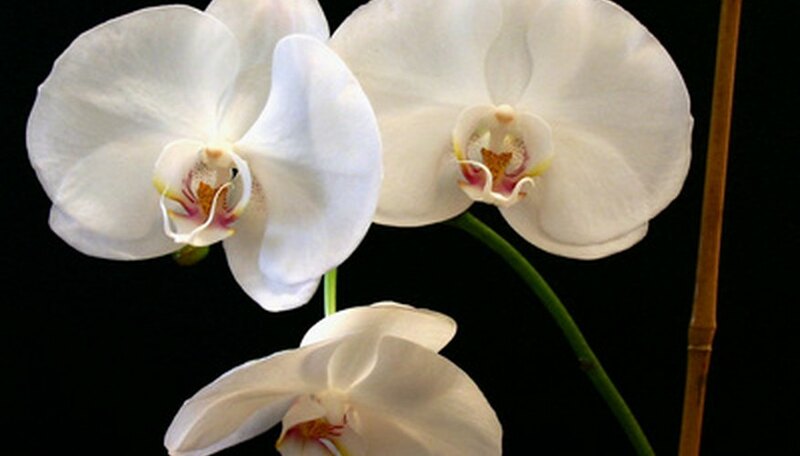 Orchids typically grow on trees and you could incorporate this into your painting, if desired. Because there are so many varieties of the orchid flower, you can substitute alternate colors for those used here; light pink, dark pink, purple and fuchsia are all common colors of orchid. You can add small arcs of white paint on the top edges of each flower for highlighting, which works especially well to add a nice finishing touch. if you want the painting to be of an outdoor scene.